Some pens are nicer than others for poetry, letters and journalling. My Montblanc 244 is one of those. It’s diminutive, has character and a flexy nib that provides the varied strokes needed for such tasks. It has patina, but is still shiny. This pen is one of the Danish Montblancs produced 1941-1954. Thus it’s at least 58 years old, and it would be interesting to know how many letters it has produced so far. The pointy cap tip differs from the later version and also signals that this pen was manufactured in Denmark. Cracked, pointy star longing to take off. Simple, sleek elegance in the wild. Still flexing it’s tines after 58+ years. Ready to slash the page with witty words. Note the smart, flat feeder. Flexed poetic prose. The inkflow is almost perfectly dimensioned for all kinds of writing – from a light touch to the more extreme flexes – with this experienced, mature and sweet nib. This entry was posted in fountain pens, montblanc, pens, writing and tagged fountainpens, montblanc, pens, photo, vintage, writing. Bookmark the permalink. Hello there, thanks for your blog, I really enjoy it! Could you tell us what the ink you used in the last photos is? It looks purple on my screen but I’m not entirely sure… Anyway it looks really nice coupled with the flex nib! That’s a great looking pen. Reminds me of my Soennecken. Excellent quality nibs. I JUST bought one of these and am waiting with baited breath for it to arrive. A nice medium flex nib. Cannot wait to sit down and write poetry with it. I’m drooling! I share the same feeling about being a part of the history when using a vintage pen. I’ve come to appreciate vintage pens more and more since they are made to be used as tools and many of them – as vintage Montblancs – are of a quality that is hard to find today, and can often be found for a very reasonable sum. Thanks a lot for appreciative feedback – it means a lot! I’m amazed at the work you do, your blog and your wonderfully perverse interest in pens and paper. But most of all I’m utterly in awe of all your high quality photographs of your pens! I have so many How and What questions but first I’d just like to know how you get those sharp close-ups? Are you using a macro lens, a tripod, extra lightning, or what? I try to get close-ups of my pens and nibs and I do have a rather advanced camera, but I never get close enough – let alone sharp enough, in focus. And the pics in your daily arsenal collection; you say they are taken with your android camera phone; now how do you get close enough to pens and nibs with that?? All in all I’m enthusiastically impressed by your website and it makes me happy to see someone take such genuine interest in pens and paper. And last; do you really own and use all these pens you have posted pictures of, or is it more of a slipping through your fingers thing? Thank you so much f compliments – I’m very happy you enjoy my blog. Not all photos in the daily arsenal are taken w my phone camera – I believe the better ones are taken w my regular camera, which is a, not particularly fancy and now quite old Panasonic Lumix FZ 28 18x zoom – not a DSLR. It does have a rather good macro considered its class, tho. I mostly use natural light and no tripod. I guess patience and creativity is what is my main ‘recipe’. Thanks a lot for stopping by and taking the time to write positive feedback – it means a lot. Great! I’ve just started to collect vintage pens, mostly 50’s and 60’s stuff, but I have a few from the 20’s as well. Never tried the newer ones. But I didn’t understand the importance of paper until I read your blog, which clarified a thing or two. From now on I’ll be more careful. A very nice specimen with a nib to match. 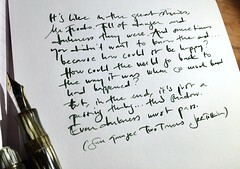 I still remember the expression on my friend’s face when he wrote with my MB234 1/2 OB flex nib. These vintage nibs are something else…. beautiful pen, beautiful writing.. very nice indeed! Thanks fort the great review. BTW, what kind of ink and notebook are used for the test? There is no feathering (maybe no bleed-through?) found on the paper. It’s three different papers: a Rhodia pad, G Lalo stationery and a Paperblanks notebook.